Like most of the bib- words that relate to drinking, bibulous has a rather benign, even homely feel to it. For me, it's even somehow nostalgic, conjuring warm thoughts of bibulous Uncle Jeremy. 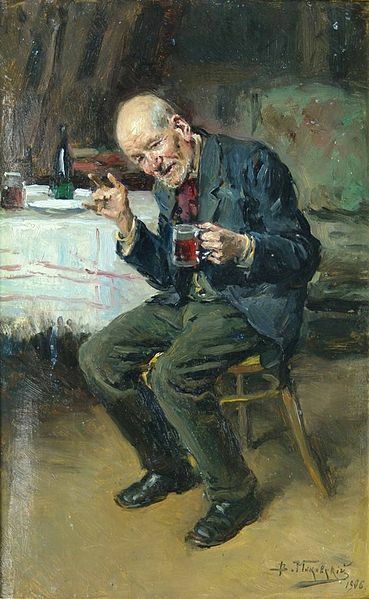 Usually laconic and sullen, Uncle Jer's tongue would be loosed by the generous application of beer so that all and sundry would be regaled with nonsensical war stories and far fetched tales of adventure and whimsy, before finally falling asleep with his head in the peanuts and having to be carried home by all of the uncles. Now I miss Uncle Jeremy too, and I never met the man. By all of the uncles? Was your uncle Jeremy so overweight he needed multiple men carrying him home? Poor man, I feel for him. Both too heavy and moisture-absorbent. That painting reminds me of late Tuesday nights when the students go drinking. That old man is probably making a valid point on today's screwed up economy and political situation. Or Wednesday, Thursday, Friday and Saturday nights. Not Sundays, who gets drunk on a Sunday? Just doesn't seem right. Not Mondays either, they are too heavy on our souls to spend drinking. Mondays come with cuddles. I always found drinking to be accompanied by cuddles generally; maybe I'm just an affectionate drunk. Do you work in a creche Bibi, or a petting zoo? I ask because I'm a window cleaner and my Mondays come with baked-in bird poo. Hm, I take it the bird poo's not up for a cuddle on Monday mornings. Pity. Maybe you should try asking them for a hug anyway, who knows, maybe one day you'll find a more affectionate one?